Players from PA Dominion (light blue) and FC Europa (white) square up in U17 Girls action. PA Dominion won the game, 2-1. 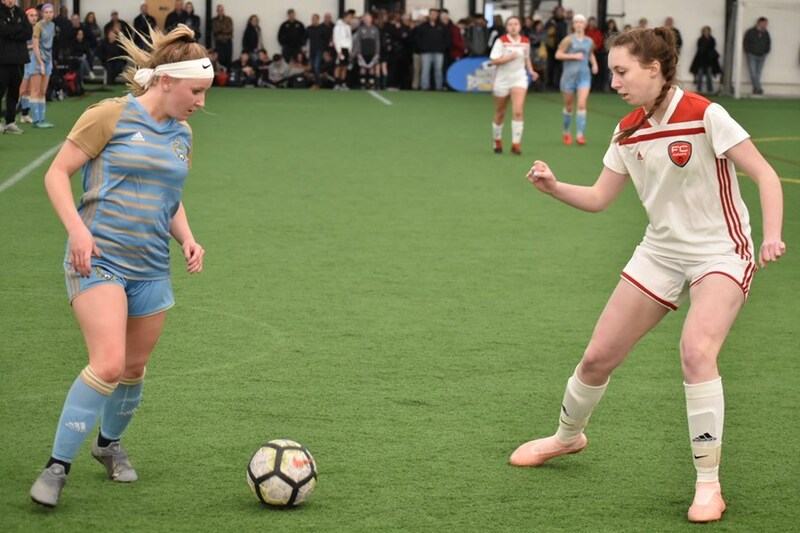 On the busiest weekend of the 2019 Eastern Pennsylvania Indoor Cup yet, seven different age groups took the field for the honor of being declared indoor state champion. The U12 girls and U13 boys and girls played at Wyoming Valley Sports Dome, while the U17 boys and girls and U19 boys and girls competed at In The Net. Here's a recap of every division. Check out the current champions page for updated team pictures of the champions and head over to Facebook to see action shots from the weekend. 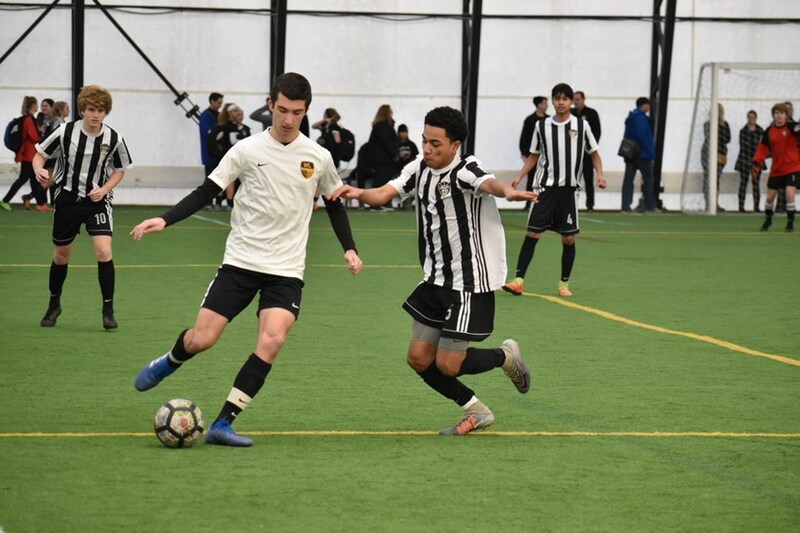 After finishing second in the 2018 Indoor Cup, Lower Merion SC Furia claimed a title this year. They defeated Keystone Athletic Grifo, 1-0, in the Elite Division final. It was quite a turnaround for LMSC. The two teams had met in the group stage, where Grifo emerged victorious, 5-0. Ukrainian Nationals Red and North Union United Strikers entered the Challenge White Division final with near identical statistics—each team carried a 2-0-1 record and +3 goal differential. So it’s no surprise the final was a close affair. Ukrainian Nationals came away with a 4-3 victory. Playing close to home—the club is based south of Wilkes-Barre—Cantolao Storms made the most of their Indoor Cup experience. The Challenge Blue champions outscored opponents, 26-2 in going 5-0. Northeast United survived a brutal Elite Division that featured nine teams and four knockout rounds. NEU earned a bye to the quarterfinals, before rolling off three straight victories, the last over LMSC Impact for the title. FC Europa Black made it back-to-back titles when each half of its roster reached the final in the Elite Division. Rather than play for a winner, they shared the medals. FC Europa had finished one-two in the group stage, both 2-0. Two 3-0 teams with +4 goal differentials met in the final: Valley SC Vultures and Benton SC Fire. The Vultures got the better of the fire, 3-1, to take the Challenge White Division. Danubia SC Hotspur prevented VE Kanoniere from taking a 2018 Challenge Cup-2019 Indoor Cup double. Danubia defeated VE, 3-0, in the Challenge Blue final. HMMS Eagle FC Impact opened the competition with a 0-0 draw, but they wouldn’t be kept off the scoresheet afterwards. They scored 15 goals in three knockout games to win the Challenge Division. The girls made a clean sweep for HMMS at the U17 level. Impact knocked off fellow central Pennsylvania club FC Ballyhoo Black, 3-0 in the final. Warrington SC Union finished atop the seven-team Elite Division group after a 2-0 group stage. Warrington then beat two strong teams, Penn United Force and LMSC Galaxy, to win the title. Lebanon Valley SC proved it’s not how you start but how you finish. LVSC went 0-1-1 in group play before going 3-0 in the knockout rounds, a run culminating with a 1-0 victory over stalwarts North Union United Cannons. Lower Merion SC Storm showed its formidability once again. Storm went 5-0 and gave up just two goals on their way to the Challenge Division title.